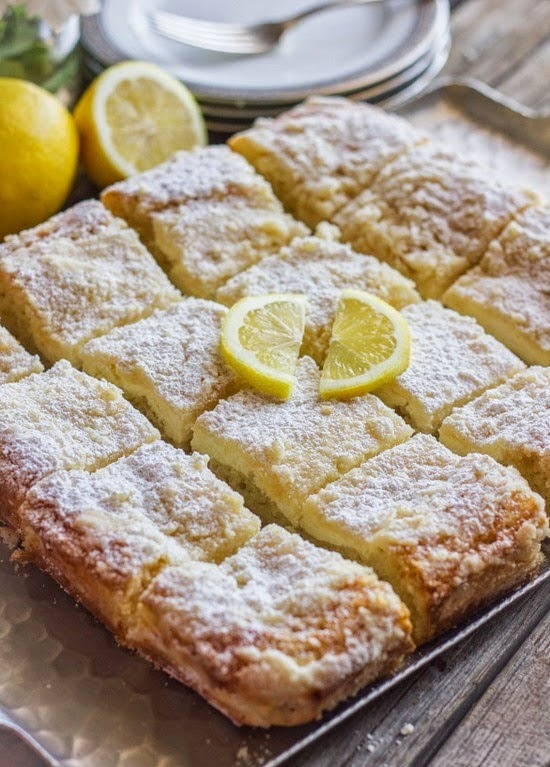 Greek Yogurt Cream Cheese Lemon Coffee Cake | FoodGaZm.. This lemon coffee cake was divine! I decided to double the lemon juice and rind, added another whole egg to the cake batter, and baked in a glass (paper lined) 8″ square pan for 48 minutes. My greek yogurt was 2%, and I used cream cheese because I didn’t have greek cream cheese. Let the cake cool about 10 minutes in the pan, then lifted it out onto a plate still in the paper. Cooled another 5-10 minutes and then dusted with powdered sugar and served while still slightly warm. This was absolutely delicious and my wife and I ate 1/3rd of this thing in one sitting (could have easily eaten the whole thing). I am really glad I doubled the lemon because the cake was still a VERY subtle lemon flavor and I might have liked even a little more lemon flavor. I could see serving this as a dessert at a dinner party (serve while still slightly warm). It is not nearly as satisfying if eaten at room temperature or refrigerated (maybe even a little on the dry side that way). Ate some warmed up for breakfast the next morning with eggs and bacon. While that was very good, I felt that this cake is really at its best if eaten alone with no competition to muddy up the subtle lemony flavor.